Mumbai, Jul 1 (PTI) Scholars working on religious and cultural studies in US have continued to perpetuate myths and biases about Indian culture and religion because of misintrepatation and lack of quality in academics, according to experts here. America looks at India from many perspectives but an important one is the religio-cultural. Although, of late, there are some token efforts to recognide and honour Hindus in US through Hindu prayers in the legislative assemblies and in US Senate (slated for July 12), the picture seems more complex when analysed academically, one of the editors of the book, Krishnan Ramaswamy, said. “Unlike in India, the academic study of religion is an important undertaking for intellectuals in America and few hundred scholars study Hinduism and other Indian religions. Many of them have continued to perpetuate myth and biases about Indian culture and religion,” he observed. These are in line with colonial and missionary caricature of India and the authors of the book fear that this might affect both young Indian Americans and even Indo-US relations. The book was released here today and will be out in New York next week. 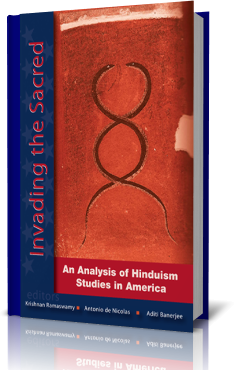 “Invading the Sacred” is product of an intensive multi-year research project that uncovered shoddy and biased scholarship driven by certain power cartels, its authors said. The book narrates the Indian Diaspora’s challenges to such scholarship, and documents how those who dare to speak up have been branded as `dangerous’. Edited by Ramaswamy, Antonio de Nicolas, a professor, and Aditi Banerjee, the book brings together essays by well- known scholars and seeks to facilitate a debate to challenge the systematic misrepresentation of Indian culture and philosophy by certain American academicians. Some disturbing examples identified in this book include scholars using Freudian psychoanalysis and field research and mistranslations to claim that Indian mothers are less loving of their children than white mothers. Influential scholars like Wendy Doniger are quoted in several places criticising elements of Hindu culture like the `Bhagvad Gita’ (in the `Philadelphia Inquirer’ in 2000) and the worship of goddesses (in the `Washington Post’ this year). The editors have pointed out that some US scholars, who claim to have studied Indian languages and culture, relate many normal every-day things like keeping children on the lap, petting and caressing them to sexuality. But these mistranslations and interpretations are never checked and corrected as part of the peer-review process of the academic exercise, the editors lamented. One of the editors, de Nicolas, an eminent and distinguished professor of philosophy, has pointed out that freedom of speech and academic freedom are both in jeopardy when scholars act in an irresponsible and unscholarly manner. Nicolas, who has taught Indian philosophy at the State University of New York, encountered many culturally arrogant American scholars who pooh-poohed the idea of India ever having “any philosophy worth the name”. Even when numerous evidence-based and scholarly works exposed the errors in the work of many US scholars, the academic establishment did not take action and instead the establishment tried to protect them by conducting a campaign that accused the critics of being Hindu radicals, he said. Banerjee has also pointed out that this bias of the academics spills out from the universities to the popular level – including school children. For instance, Microsoft’s popular encyclopedia, Encarta, which is used by school and college students around the world, had a very biased essay that portrayed Hinduism as violent and superstitious. The book records that after a former Microsoft engineer, Sankrant Sanu, published a detailed comparison of Encarta’s treatment of Christianity, Islam and Hinduism, Microsoft agreed that there was bias and replaced the chapter on Hinduism with a balanced one. Indian academics should rise to the occasion and do a better job of critiquing and debating Western scholarship on India, the authors said. “Enough funds should be made available for scholars so that such detailed work can be carried out in India to counter such misrepresentations,” says Rajiv Malhotra, a US-based diaspora intellectual who first exposed many of these biases.